1) Dress shank of hook and tie in Dumbbell eyes behind the eye. 2) Tie in a small bunch of flash above the barb. 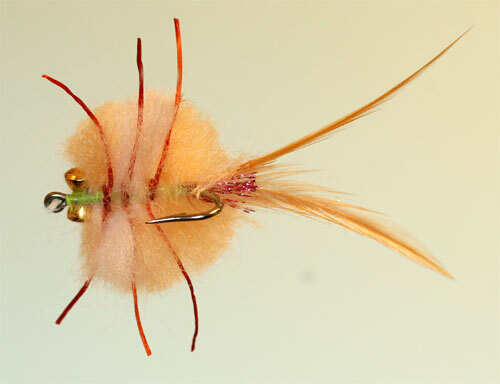 3) Tie in a pair of hen hackles curving outward to simulate the pincers. 4)Reverse the hook in the vice and starting below the barb tie in short lengths of yarn at 90 deg to the shank using figure of 8 method. 5) Repeat with alternate shade to create a striped body. Use 2 of the primary colour to one for the stripe. 6) Repeat this process right up to the dumbbell eyes. 7) Trim the yarn to form a crab shaped body. 8) Tie in the rubber legs using a simple half hitch and trim the legs to length. 9)A very small amount of super glue can be used on the leg knots as well as the dumbbell eyes. 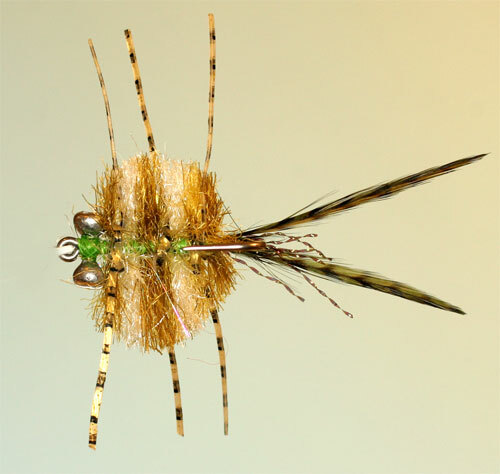 10)This fly can be fished in the surf zone with as sinking line as well as letting it drift in deeper water.